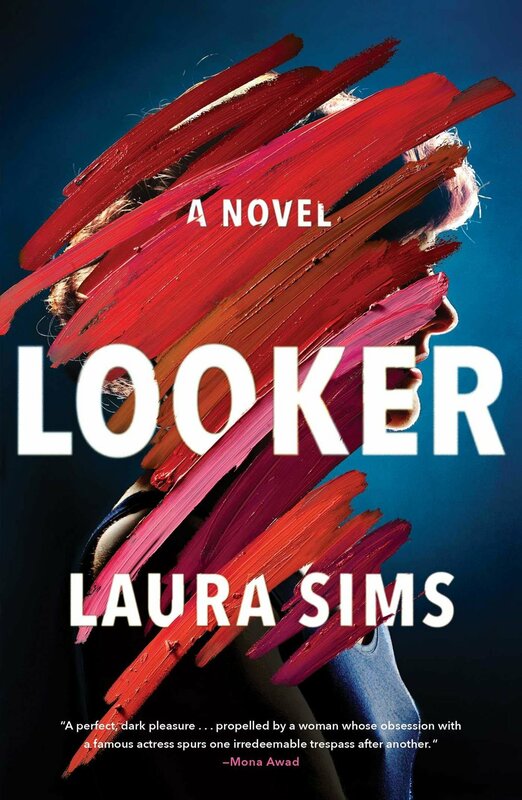 Looker , the debut novel by Laura Sims, is marketed as a thriller yet that is not what I read. What I read was a dark, psychological character study of the slow unraveling of a woman coping with trauma, emotional stress and her own psychologically induced obsessions. The story centers around our unnamed narrator, a middle-aged woman living in an unnamed city, bored with her job as a night school professor, and recently separated from her husband due to her inability to become pregnant. When a young actress moves in down the street with her screenwriter husband and three children, the narrator becomes fixated on everything that the actress has, that she does not. The narrator is constantly comparing her boring existence to the actress’s glamorous one. She lives a lonely existence, with only a few people in her life — Mrs.H, a snoopy neighbor; Bernardo, one of her poetry students she thinks is hitting on her; and Cat, a pet her husband left behind. Her increasing obsession with the actress and her family comes to a head at a block party, where the narrator tries to make meaningful contact with the actress, resulting in disastrous consequences. Looker was a bit of an uncomfortable read, to say the least. Sims, by using the protagonist’s point of view and present tense, doesn't just take the reader on the ride with the narrator, but puts us in the driver's seat with her, in her psyche. We see everything from her perspective and with her sanity slowly slipping, we question whether a lot of her observations are truths or delusions. As her character slips farther from reality, her actions become more daring, and as the reader, we feel almost a sense of guilt, like we were an accomplice to her bad actions. From sitting on her porch, chain-smoking and drinking while enviously watching the children she will never have play in the park across the street, to finding the perfect place outside the actress’s house to spy on her and stealing items from their front yard, we watch through her eyes as she repeatedly makes bad decisions. Being privy to her inner monologue makes her inevitable circling of the drain that much more heartbreaking, raw, and brutal. But the fact that the narrator is our unhinged protagonist is Looker's strength. We watch helplessly as our doomed narrator fights what is sure to be a losing battle with her own demons. This all culminates into her becoming increasingly more bitter and angry with despair, while the reader feels an increasing sense of dread. The ending ties up nicely, wrapping up most loose ends, but still leaves a few crumbs for the reader, leaving us wanting more. The story has a brisk pace, with a bit of dark wit and searingly sharp prose. Sims is unrelenting in allowing her narrator to consistently make one bad decision after another, causing an otherwise harmless preoccupation to spiral into a lethal and frightening compulsion. Looker is not a twisty thriller but, rather, a tale of extreme resentment, jealousy, and self-hatred. A cautionary story that sheds a bright light on the fragility of happiness. Firmly plotted and beautifully written, Looker is an unsettling character examination of one woman’s harsh descent into obsession and madness.